Working brakes are a non-negotiable when operating your vehicle. Whether you’re putting the pedal to the metal or cruising at a slower pace, it can take a quite a distance for your vehicle to come to a stop. If that distance is too long because of poorly performing brakes, it can be the difference between a close call and total catastrophe. Do I need my brakes checked? Take a look at the most critical warning signs for one of the most important safety features in any vehicle. Beyond obvious warning lights and the feeling of poor brake performance, there’s a few other things that you should be on the look out for. With driving comes wearing down of the pad between the rotor and the caliper. When these wear down and get thinner, they won’t stop your car as quickly. Check to see if these are too thin by looking between the spokes of your wheels, between the caliper and rotor. The pad should be at least ¼ inch thick. Screeching, squealing, or any grinding while braking is a sign of brake breakdown. In addition to it being time for a brake job, you might be doing damage. If your car is pulling to one side, it might be because of a brake issue like a stuck caliper. Vibration is normal for rapid, emergency-type braking. However, if you’re getting vibration during normal braking, it could indicate a problem, like warped rotors. If you’re brakes are getting “mushy” where you have to really force the pedal to the floor to engage your brakes, its time to check for one of many brake issues. Get Outstanding Brake Service Today! Why wait to have an outstanding brake service go-to? Get to know us before there’s trouble! If you’re already experiencing some issues with your brakes, schedule an appointment with one of our highly qualified and meticulously trained technicians. 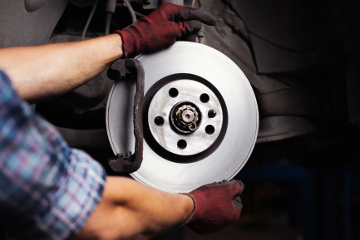 We can have you back on the road with safe, reliable brake work in no time. Contact us today to get started.